UPDATE: Congratulations to Kristina V.! She’s won $250 worth of Seaflora Wild Organic Seaweed Skincare! Kristina has been contacted by e-mail. Thanks to all who entered and be sure to check out this amazing skincare line! Living in such an abundant place, Vancouver Islanders have successfully harvested this land and its shores to create everything from mead wine to organic vegetables. 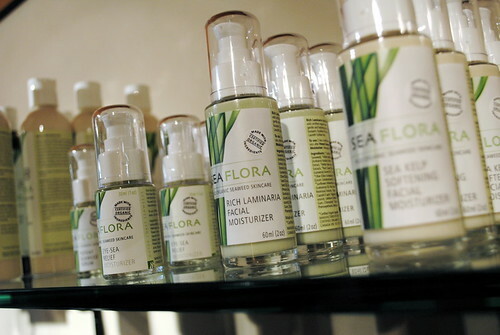 Thanks to Diane Bernard – also known as ‘The Seaweed Lady’ – Seaflora Wild Organic Seaweed Skincare has been making an incredible name for its effective thalassotherapy products both locally and abroad. 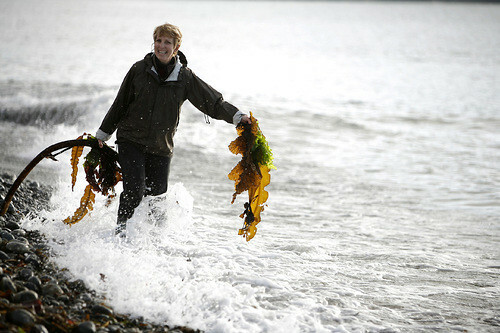 Made with seaweed selectively harvested from company boats offshore or directly in the Sooke, BC inter tidal zone (during low tides), Seaflora’s products are fresh, nourshing, animal-friendly and entirely sustainable. And the best part? Their products work. I’m no stranger to their line of exquisite skincare, and wanted to give my readers the opportunity to reap the benefits of locally-produced luxury products. 3. Find Vancouver Island Blog on Facebook, click the Contests tab and leave me a comment with your favourite skincare tip! I will pick one winner at random on Monday, March 5th at 3:00 p.m. Good luck! Winners must be 18 years of age or older. Winners cannot have won a contest on Keira-Anne.com within the last six months. This prize is not transferable and is of no monetary value. Keira-Anne.com nor its affiliates or the contest prize sponsor bear any responsibility to the winners, the collection of the prize and/or the use of the prize. From now until March 3rd, you can enter to win an exclusive romance prize package from Old House Village Hotel & Spa’s Wedding Show, SNAP Weddings and Keira-Anne.com – especially designed for newly engaged couples! For more information on how to enter, visit the contest page now! Until February 29th, you can win one of two pairs of lift tickets to Mount Washington Alpine Resort. Enter here! I would like to try the iridea purifying facial masque, the balancing sea kelp concentrate and the eye sea relief moisutrizer. Soothing Sea Kelp Soak would be most welcome! I could use a relaxing bath that relaxes me and my sore body that promotes a good sleep … Hmm … Should get some …. I’d love to try the Eye-Sea Relief Moisturizer. Anything that can help with those dark circles would be a great help. I’d love to try the Kelp soak in my outdoor tub! I would absolutely love to try the Therapeutic Firming Seaweed Gel. I would LOVE the Potent Sea Kelp Masque! Immerse my being in the Soothing Sea Kelp Soak… discovering pure bliss….. I would love to try the potent Sea Kelp Masque! I’d love to try the sea kelp soak, ’cause I’m a sucker for baths. The wild sea garden tea sounds interesting! Though all your products would be nice to try! I’ve been looking for a new exfoliant for a while, so I would love to try either the Iridaea Exfoliator or the Potent Sea Kelp Exfoliator. I’d like to try the Eye-Sea Relief, The other products i use are fantastic, and i’m sure this will have the same beneifts. Would love to try the Rich Laminaria Facial Moisturizer. Sounds lovely. Detoxifying Fucus body wash and everything else…. I’d love to try their Therapeutic Firming Seaweed Gel. Hope it helps reduce lactic acid buildup from strenuous workouts! I’d love to try the Rich Laminaria Facial Moisturizer. I have oily skin so this seems like a great product for me to try. But it all looks beautiful and have been going to Sooke beaches for years. Great to know we are harnessing these great natural products. I would love to try the Iridaea Light Facial Masque. It sounds like it would leave my skin soft and moist. I would like to try the foaming fucus cleansing concentrate and rich laminaria facial moisturiser, all the products sound great! I have tried and love the firming seaweed gel! I’d LOVE to try ALL of their products but if I had to choose just one – the Sea Kelp Body Polish looks uber cool! I would like to try one of the exfoliants and a masque, and of course a lot of their products. I read an earlier entry when you had tried the product and loved it. I like to try anything produced on Vancouver island. I would love to try the Balancing Sea Kelp Concentrate – I think my skin would love it! They all look great, but perhaps the firming seaweed gel? I would love to try the Rich Laminaria Facial Moisturizer. I have had a Sea Flora facial before and it was completely AMAZING. I encourage and support local products as much as I can. I would LOVE to try the sea kelp body polish and soak! I’d most like to try Soothing Sea Kelp Soak. Wild Sea Kelp Body Lotion is the product I would love to try!